Identification: Fringes are checkered. 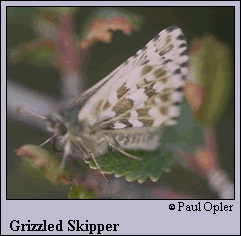 Upperside is gray-black with squarish white checks. Underside of hindwing is gray-brown to black checkered with whitish spots; veins are white. Male has a costal fold enclosing scent scales on the forewing. Life history: Males patrol and occasionally perch all day in open areas in their search for receptive females. Eggs are deposited singly on leaves of the host plant. Caterpillars feed within shelters of webbed leaves. Flight: One brood from March-May in the south, requires 2 years to develop in the subarctic. Caterpillar hosts: Wild strawberry (Fragaria virginiana), Canadian cinquefoil (Potentilla canadensis), varileaf cinquefoil (P. diversifolia), and cloudberry (Rubus chamaemorus); all in the rose family (Rosaceae). Adult food: Nectar from flowers of low-growing plants including blueberry, wild strawberry, and Canadian cinquefoil. Habitat: Open areas near woods including valley bottoms, barrens, meadows, grassy hillsides, tundra, scrub oak openings. Range: Holarctic. In North America, from Alaska south and east to central Ontario and northern Michigan. Isolated populations in Labrador and arctic Quebec, the central Appalachians, and the Rocky Mountains from central Alberta south to northern New Mexico. Conservation: Populations on eastern shale barrens (subspecies wyandot) should be monitored and conserved. Management needs: Determine management needs for subspecies wyandot and implement if necessary.